Opposites argue. They yell at each other without truly listening. It’s the point and counterpoint comedy of Saturday Night Live’s classic Weekend Update. We laugh at Jane Curtin and Dan Aykroyd because the lampoon reveals satire in our own lives. However complements don’t yell. Complements are improvisational theater. A ridiculous claim by one player is the launching pad for the next. The audience moves through the unfolding narrative because the actors know that to sustain attention, they must work together. At first, unrelated ideas are absurd. But the gift of an artist to show connection between unlikely things. It is this gift to which we will attribute Chefs Rene Ortiz and Laura Sawicki. 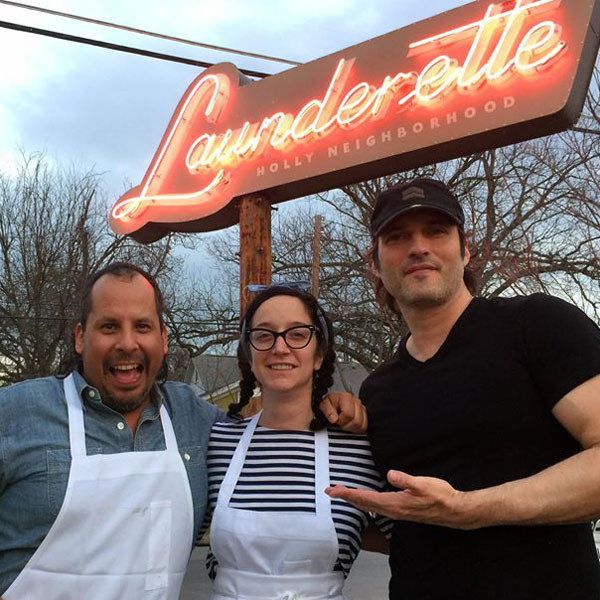 These are the improvisational actors who spin mighty tales of romance and mystery at their newly opened Launderette in Austin Texas. Rene and Laura understand the duality we seek: to be safe; and to be adventurous. To crave stability and yet pursue novelty. So it’s perfectly natural that their culinary oasis in East Austin began as a wash and fold. Coin operated. Flat concrete floors. Now, the noise of tumbling dryers and buzzers is replaced by the clink of craft cocktails and a kitchen line so tightly compact, they’d have to be best friends. This troupe turns out visually arresting dishes like crab toast (pictured above). 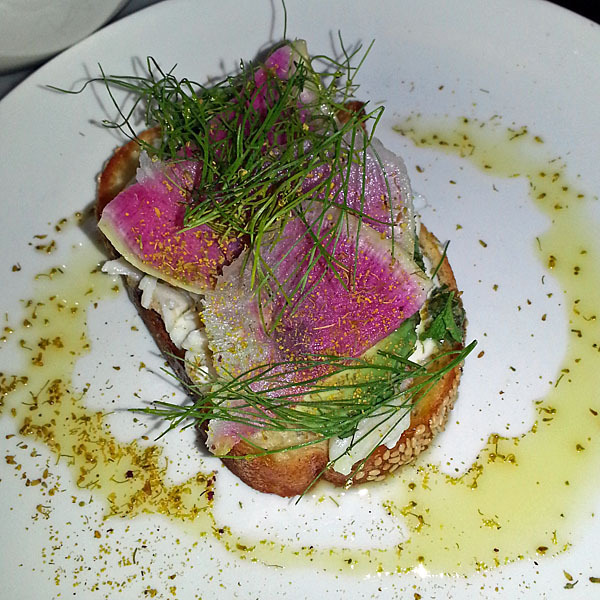 The menu maximizes the impact by beginning with an austere description: fennel aioli, radish, top-mint vinaigrette, semolina bread. What arrives tableside is a modern still life of pink and green on white plate. Fennel fronds like a simple veil to the smiling flamenco dancer underneath. On the palate, fireworks begin. Chefs combine known companions then whip it with licorice. The natural zip of fennel and the bite of radish turn buttery avocado and sweet jumbo lump into a rock concert. The same could be said of Brick Chicken. If you grew up in the South, there was a cast iron skillet permanently on the stove. From it’s loving surface came cornbread, seared burgers and chicken who’s skin would be so crisp that even Colonel Sanders would shed a tear. Launderette opens the door to memory in that way. She re-invents brick chicken. 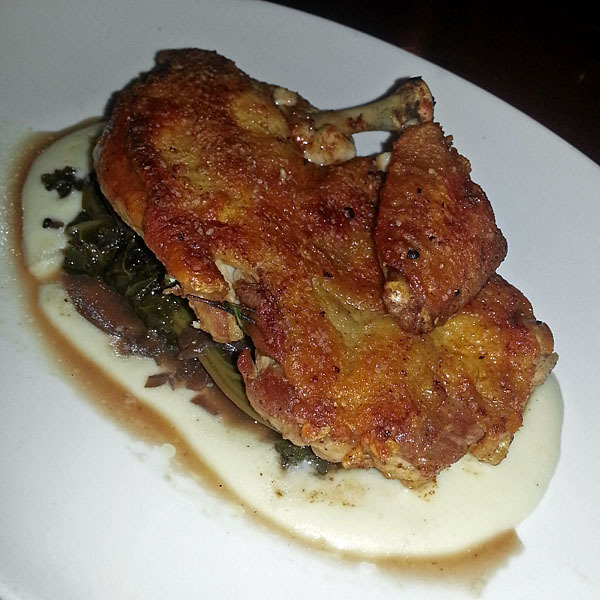 This time with a sweet & sour braised chard and a sauce made from potatoes and Gruyere cheese. They anchor us in history (stability) and take us on a journey (novelty) in a single dish. 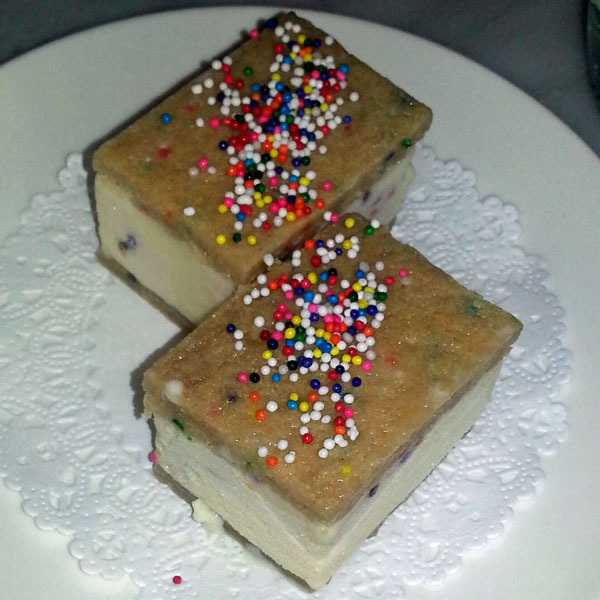 Birthday cake ice-cream sandwiches behave that same way. The taste combination of grocery-store whitecake smothered in frosting with sprinkes puts us squarely in the backyard of mom and dad’s house. Our 7 year old friends running through the grass with cone shaped hats. The dog bouncing between each guest waiting for something to fall. In this modernized version, cake has become a silky but firm cookie which still reveals a heavy hand of vanilla extract. It does not mask the love that comes from licking from cake bowl beaters. Chef Laura need only add multi-color pill-balls to signal our time-travel. The rest is a trip on the tongue. Hillary, with her blond bouffant may have looked in character for a laundromat in the 70’s, but she was no throwback housewife. She was our navigator through the garden of earthly delights. Her kindness and sharp instinct kept our table humming for the evening. And when she cupped her hand just below the jawline to describe the nights special entree, it was clear we were in extraordinary luck. 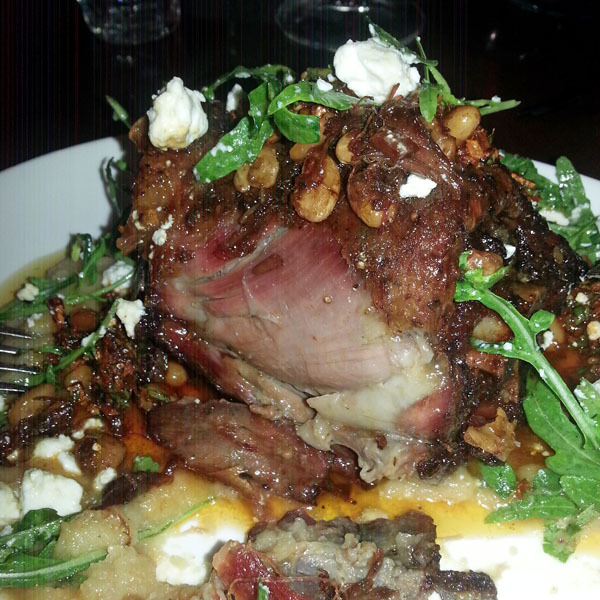 That lamb roast emerged from the kitchen floating on a puree of fava beans. Feta and arugula dotted the plate. One rich bite after the other until even a glutton must surrender to the portion. 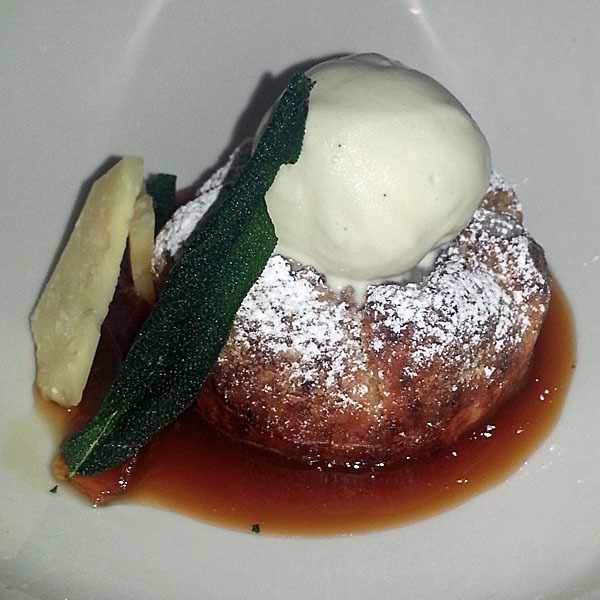 This is a dish from the victor’s table. The creaminess of the puree adding a gentle foil to mild gaminess of the meat. Sips of Cabernet Franc cut through the dish’s headiness. It is a grand dance between fictional characters. To conclude, our party ordered a round of deserts. The most surprising turned America’s favorite pie into a Tuscan love affair. Cheddar and apple pie is a combination as old as New England. Sharp, briny cheese with gooey, cinnamon apples may seem like an odd couple to the Lutherans of Minnesota. But in the world of America’s culinary history, it’s a famous pair. Now take that marriage between Bogey and Bacall and cast in Hemingway’s Italy. Sage blossoms into a hovering ice-cream cloud. The three way flavor combination is a love triangle. Three gravitational forces which tumble over and over in the mind sending dopamine-filled feelings of satisfaction. As rewarding as the chance glance of Uma Thurman smiling. Yes. Rene and Laura started re-washing our ideas of traditional food. They tumble flavor combinations until static cling of creativity is impossible to ignore. And they re-fold expectations in a way that will forever change the culinary dialogue.